Well, I am taking a break. I am nearing the end of the tunnel as far as packing my current home is. I will miss this house, I have the most incredible slate floor, there are many memories here, most of them overshadowed by the 17 weeks of bed rest I was on and my staring at gackles and all sorts of assorts animal life in our downtown hood. However, I am so very excited to be moving to this home! 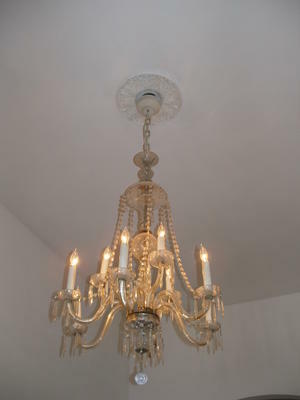 I guess that today I will introduce you to our chandelier. From what I can tell from the records I have on the house a pretty fancy lady had it put in the forties, but I am not sure I buy it. See, if you look where it is hanging from the ceiling, it looks like it may be falling, but... If you were here we might take you up to the attic so you could see the mechanism to raise and lower it (though it is August here and it would not be all that pleasant an experience)... That mechanism, I must say looks pre 1940... Though I guess that doesn't mean that she could not have bought an antique then... And replaced a candelabra... The good news that while it is not in absolutely perfect shape, it is in pretty good shape and I think I only need to find one little piece of glass to fix it.